It is a high ridge in Antarctica on the East Antarctic Plateau where temperatures in several hollows can dip below minus 133.6 degrees Fahrenheit (minus 92 degrees Celsius) on a clear winter night. Scientists made the discovery while analyzing the most detailed global surface temperature maps to date, developed with data from remote sensing satellites including the new Landsat 8, a joint project of NASA and the U.S. Geological Survey (USGS). Ted Scambos, lead scientist at the National Snow and Ice Data Center in Boulder, Colo., joined a team of researchers reporting the findings Monday at the American Geophysical Union meeting in San Francisco. Researchers analyzed 32 years' worth of data from several satellite instruments. 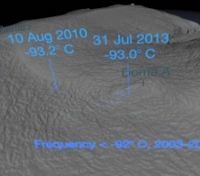 They found temperatures plummeted to record lows dozens of times in clusters of pockets near a high ridge between Dome Argus and Dome Fuji, two summits on the ice sheet known as the East Antarctic Plateau. The new record of minus 136 F (minus 93.2 C) was set Aug. 10, 2010. 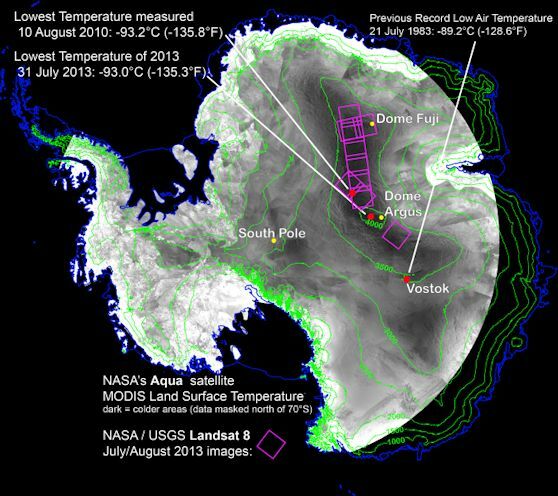 That is several degrees colder than the previous low of minus 128.6 F (minus 89.2 C), set in 1983 at the Russian Vostok Research Station in East Antarctica. The coldest permanently inhabited place on Earth is northeastern Siberia, where temperatures in the towns of Verkhoyansk and Oimekon dropped to a bone-chilling 90 degrees below zero Fahrenheit (minus 67.8 C) in 1892 and 1933, respectively. "We had a suspicion this Antarctic ridge was likely to be extremely cold, and colder than Vostok because it's higher up the hill," Scambos said. "With the launch of Landsat 8, we finally had a sensor capable of really investigating this area in more detail." The quest to find out just how cold it can get on Earth -- and why -- started when the researchers were studying large snow dunes, sculpted and polished by the wind, on the East Antarctic Plateau. When the scientists looked closer, they noticed cracks in the snow surface between the dunes, possibly created when wintertime temperatures got so low the top snow layer shrunk. This led scientists to wonder what the temperature range was, and prompted them to hunt for the coldest places using data from two types of satellite sensors. They turned to the Moderate Resolution Imaging Spectroradiometer (MODIS) instruments on NASA's Terra and Aqua satellites and the Advanced Very High Resolution Radiometer (AVHRR) on several National Oceanic and Atmospheric Administration satellites. These sensitive instruments can pick up thermal radiation emitted from Earth's surface, even in areas lacking much heat. Using these sensors to scan the East Antarctic Plateau, Scambos detected extremely cold temperatures on a 620-mile stretch of the ridge at high elevations between Argus and Fuji, and even colder temperatures lower elevations in pockets off the ridge. Then, with the higher resolution of the Thermal Infrared Sensor (TIRS) aboard Landsat 8, the research team pinpointed the record-setting pockets. The team compared the sites to topographic maps to explore how it gets so cold. Already cold temperatures fall rapidly when the sky clears. If clear skies persist for a few days, the ground chills as it radiates its remaining heat into space. 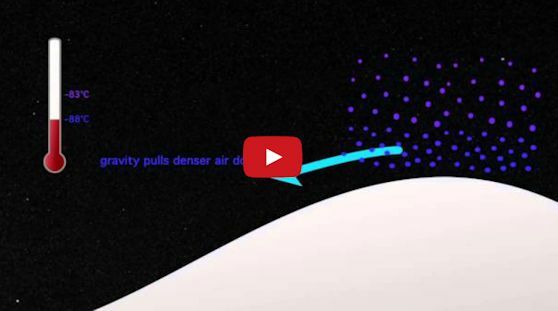 This creates a layer of super-chilled air above the surface of the snow and ice. This layer of air is denser than the relatively warmer air above it, which causes it to slide down the shallow slope of domes on the Antarctic plateau. As it flows into the pockets, it can be trapped, and the cooling continues. "By causing the air to be stationary for extended periods, while continuing to radiate more heat away into space, you get the absolute lowest temperatures we're able to find," Scambos said. "We suspected that we would be looking for one magical site that got extremely cold, but what we found was a large strip of Antarctica at high altitude that regularly reached these record low temperatures." The study is an example of some of the intriguing science possible with Landsat 8 and the TIRS instrument, which was built at NASA’s Goddard Space Flight Center in Greenbelt, Md. Since its launch Feb. 11, Landsat 8 has captured approximately 550 scenes per day of Earth's land surface. USGS processes, archives and distributes the images free of charge over the Internet. "With Landsat 8, we expect to see more accurate and more detailed maps of the landscape than we've ever been able to see," said James Irons, the mission's project scientist at Goddard. "If change is occurring, I think we'll be able to detect it earlier and track it." Researchers also are eager to see what new results come out of Landsat 8, both from icy plateaus and Earth's warmer regions. "What we've got orbiting Earth right now is a very accurate and consistent sensor that can tell us all kinds of things about how the land surface of Earth is changing, how climate change is impacting the surface of Earth, the oceans of Earth, and the icy areas of Earth," Scambos said. "Finding the coldest areas on Earth is just the beginning of the discoveries we're going to be able to make with Landsat 8."